Over the years, the Guardians of the Galaxy have been through many ups and downs. While Gamora is a villain of some sort and Rocket has skedaddled, Drax is dead. The last remaining guardians are just Quill and Groot but that’s not the only change. Recently we saw a new look of Groot. 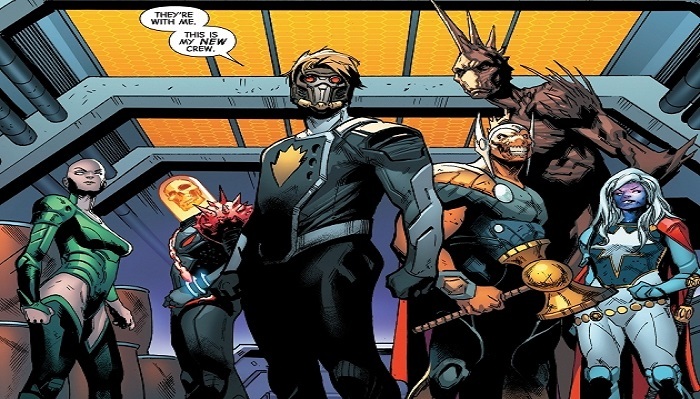 Guardians of the Galaxy #1 largely deals with ultimate devastation from Infinity Wars which saw Thanos decimate and the universe folded into itself, the latter of which was largely rectified by the end of Infinity Wars #6. While many of the universe’s players board on Thanos’ ship and are given the startling news that the Mad Titan passed his consciousness into someone else prior to his death, Quill and Groot are headed to Knowhere aboard the Ryder. It’s there that readers are initiated to a completely new look for Groot. His mohawk looks spiffy now. Replacing high forehead that looks similar to part of a hollowed log are some major spikes to that mohawk, spikes that are complemented and spruced up by corresponding spikes over other parts of his body such as his shoulders and elbows. There’s even a great part in the issue where Quill tells Groot to knock it off with the sawdust and Groot is making these spiky alterations himself in the ultimate form of body transformation. We are sure you liked the new look just as much. We will keep you updated on the developments.